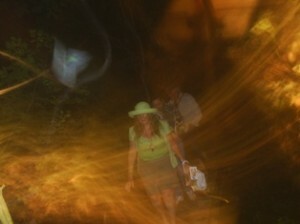 Have you ever noticed strange streams or strings of light in your photos. Some paranormal researchers call these lights ‘ super-charged orbs’ and claim they are the researchers greatest evidence of the after life. A name I prefer is ‘Elven Currents’. Dr. Robert Neil has explained them as a ‘paradigm symbiosis and interaction. Where the images meet, a central being is formed which embodies the interaction creating a flow or exchange of information. In the words of Robert Neal Boyd, www.ralian.com, “Elven currents strike me as not being particularly of an object, but the spaces BETWEEN objects. Not the emitter of forces…but the area of interplay between forces…so much so that one could think of that space between being it’s own force.. Think of the space between two gravitational areas…which is not of one gravity or the other, but the area where they meet. That feeling of surface tension, that turbulent stillness. that all the matter we see is synchronized with our own. According to Quantum Physics, whenever an event takes place or a decision is made in which there’s a choice of possibilities, the universe splits, without anybody noticing… every possibility is realized but in different universes. Can you even begin to imagine the possibilities here! Oops, I just created another universe, with just that question. And now you have created even more universes by reading this and thinking about the possibilities – and more universes are being created from all those that have read this passage! Quoting Professor Fred Alan Wolf, The Spiritual Universe: How Quantum Physics Proves the Existence of the Soul, “ As fantastic as it sounds, the new physics called quantum mechanics posits that there exists, side by side with this world, another world, a parallel universe, a duplicate copy that is somehow slightly different yet the same. And not just two parallel worlds, but three, four or even more! In each of these universes, you, I and all the others who live, have lived, will live, and will ever have lived, are alive! (Wolf 1996). Dr. Claude Swanson , educated as a physicist at MIT and Princeton University , and the author of The Synchronized Universe, explained to me quite clearly the principle behind the parallel worlds. I quote Dr. Swanson, “The synchronization principle leads to the conclusion that all the matter we “see” is “synchronized” with our own. In a vortex area, portals are created, which are doorways into the other worlds or dimensions. When this happens time and space become distorted and a lot of strange things can and ‘do’ happen. I have a strange fascination for these inter-dimensional doorways , but because of all the things we have experienced , I also have a great respect for them and what they are capable of. One may step into a doorway leading into another dimension and never notice they had gone. Other times, it is quite obvious that you are not in the same place nor the same time. Some people have stepped into them, never to have returned. We have photographic evidence of people disappearing into these portals. I and others have seen and photographed strange entities that live within the veil. I am no stranger to the phenomena of the portals. hidden gateways. I have watched objects appear from out of the nothingness and have been photographed several times disappearing through the gateways into the other realms. When I first started researching the vortexes I only knew what took place around us, after reviewing the photos we had taken with our digital cameras while we were out in the field. Later, after I had gained some confidence in my ‘sensitive’ abilities, I was able to actually hear and see the vortices and the spirit energies. Now, when I step into a portal, I immediately sense the time and space distortion it has created. When walking through my favorite portal area in a wooded area outside of Burlington, Wisconsin, I ‘tune’ my senses to the sounds and smells of the forest. Upon walking into a portal, the sounds of the forest will either become very feint or disappear completely. As if walking into a vacuum, the pressure of the air changes and I will experience a ringing in my ears, a pulsating sensation in my third eye, which is located above the bridge of the nose , at the center of the forehead. I will experience a small headache or my vision will blur. The equilibrium is off and I have a tendency to lose my balance or walk like I have had a few too many drinks at the local pub. I and other researchers have experienced time loops in the portal area – where one action is repeated. For example, I may walk by a tree one time and find myself walking by the same tree again – knowing I had only passed it once. It reminds me of the movie , The Matrix , when the black cat came walking through twice. Some portal areas are heat sensitive, causing those that enter to become very warm. Some to the point of breaking out in a sweat. Others have the opposite affect and feel a sudden drop in temperature. Emotions and judgement are affected as well. I have noticed that people I take on tour to these portal areas, sometimes show signs of exhilaration and others become quite and melancholy. It also seems the oxygen level may drop somewhat . I have documented people, yawning as they are walking through. Another symptom of experiencing the portals on our trips, is that while some come out of the portal area energized others are drained of energy, feeling quite tired. When this happens I always suggest that they go home, take a warm to hot bath with one or more cups of epsom salts in the water. Relax, drink a glass of red wine and allow the salt in the water to rid the body of any negative energy it may have absorbed while in the vortex. Brad believes the original attitude of a person becomes intensified while in the portal. I agree with him on this. I also believe that a person’s attitude will draw ‘like’ spirits around them. Thus, negative will attract negative and positive will attract positive. So, my suggestion to you is, stay out of these areas if you are depressed, angry or if you have been drinking. Physicist , Dr. Robert Neal Byrd states that it is highly conceivable that we are experiencing interaction with multi-dimensional entities. For those that want to explore the dimensional realms, I suggest proceeding with caution. Although I have spent years photographing these wonders, there is a danger element to this. While some of these portals are permanent , some are unstable, manifesting for only brief moments in time. Although Byrd finds it conceivable that a person might be able to pass through these ‘doorways’ , the issue for him, is the return path. If the doorway closes while a person is still in there, the trip could become a one way ride to who knows where . I and others have entered these realms quite successfully, but it is wise for the dimensional explorer to proceed with caution and always keep in mind the possibilities of not returning. There is an amazing place called by the Burlington locals, ‘Dead Man’s Hill’ . It is a few miles outside of Burlington. I learned of this area from ‘Bruce’ , who came into my office to report a bigfoot sighting he had there when he was a young man. He also said that the Wisconsin werewolf, known as the Bray Road Beast had also been spotted there, carrying off, under his arms, two dead sheep. 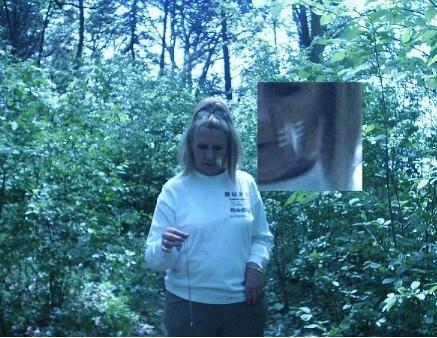 Knowing that some believe that the bigfoot and creatures such as the Bray Road Beast have been reported to be hiding within the dimensional veils, I got a few people together and went out to the area to check it out for possible portals. These doorways would allow such creatures to move freely about, going in and out of the worlds as they desired. Dead Man’s Hill was named after an old cemetery that was built on what looks to be ancient tumuli or mound. Of course, to those just passing by, this mound would probably look like a small rounded hill. 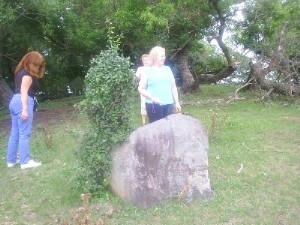 Arriving at the top of the mound (hill) we found an ancient altar stone that points to the winding river below. I photographed the girls standing next to this stone. Later, looking at the photos, I realized that each of these girls were emitting a glowing blue light around their bodies. Apparently this stone is quite powerful giving off tremendous energy! In earlier years, these stones were quite common, but were later destroyed by early missionaries, while they were converting the ‘pagan’ way of the American Indian to Christianity. More were destroyed through agricultural land clearing. There is also evidence that some were intentionally ‘tipped’ in a deliberate attempt to disguise their use. Yet, as late as 1880’s , gifts or offerings were still being left at the stones that survived. So..the next time you encounter a rock which seems to ’speak to you’, consider the spirit (manitou) that lives within and give some sort of offering. I use tobacco or candy, but anything will do – as long as it comes from the heart. Even a strand of your hair is considered a good offering. Its not the gift , but the ‘intent’ of the gift that matters. As we stood, at the top of the mound (hill) , we immediately sensed the vortex . We also noticed that the trees were twisted and gnarled from the years of spinning vortex energies. We also found nut trees there, which is another good indication of a vortex area. Not only did we feel the sensations of the vortex, but we actually stepped into a parallel universe! This dimension was so similar to ours that we would have never known about it if one of the researchers, Patty hadn’t been watching the time. Fortunately, I had a radio show to do later on that evening and Patty was keeping track of time for me, so that I wouldn’t be late getting back to the Center. At one point, in time, she looked at her cell phone , exclaiming that we had to leave as it was already 7:33 and we were running late. Hearing this, we headed back down off the mound area and back to the car. The distance wasn’t far and it only took us two to three minutes to complete the journey back. After we arrived at the car, one of the girls, Sharon announced that Patty was off on her time. Sharon said that , according to her clock on the dash board of the car , the time was only 7:18 . This was a 15 minute time difference. While the girls were arguing over the time difference, I had Brad check out the time he had on his watch. His watch also read 7:18 . Well Patty grabbed her cell phone to take one more look. To her and all of our amazement, her cell phone time now read , just like Sharon and Brad’s the time 7:18! It had actually switched back from 7:33 to 7:18! How strange is that – well you are about to find out. Fortunately for us, I was doing a show with Dr. Alford, who is familiar with space/ time distortion and portals. I related the story to Clifford about our time experience at Dead Man’s Hill. He explained that ‘ we had stepped into a parallel dimension while on the hill…a dimension ‘almost’ exact to ours – except it was 15 minutes into our future. He then went on to tell me that ‘ while we were in the other world, we should have seen things moving about, through our peripheral vision.’ As he said this, I remembered back to Sharon making comments to us about seeing just this type of phenomenon. He also said, ‘ we were lucky that we came out the same way as we went or we could have been stuck in that world permanently’. After listening to Clifford, I now make sure to exit a portal area the same way as I went in. We were lucky that day. We found the portal, we entered, experienced it and came out safely to bear witness that such places do exist! The Image of the Girl in Front is a ethereal embodiment of the girl performing a ’shamanic connection’, which creates a connection to the ‘other worlds’. When the connection happens, the girl from the ‘no-thingness’ becomes part of the pattern. Photographed by Mary Sutherland See http://www.burlingtonnews.net/hauntedtours4 for more photos such as this. Then – A materializing pattern. And Finally – A Material Pattern! I find the phenomena of apportation quite fascinating. I imagine, the primary reason for this is that I actually have experienced these type of events. The first experience I had was in the 1980’s while living in Apache Junction. This area is in the Superstition Mountains which has always been known for its vortexes and mysteries. One night, while my husband was on a business trip, I went to bed and pulled my two children in with me. The bed was situated in such a way, the head of it was up against the bedroom window. It was warm that evening, so I had left the window open. At the same moment, a vision came over me, showing me where I had been. It showed me that I had been in a place that looked Grecian. It was a large library supported by tall rounded marble type pillars. There were several large rooms there with people either walking around with books in their arms or sitting at marble tables studying. The people were dressed in some sort of white linen material , draped over their bodies. I saw myself standing in a hall which was located off one of the larger rooms. On both sides of this hall were high shelves stacked with books and scrolls. As I am seeing this vision, I again, heard the voice. This time the voice told me ‘ This is the Great Hall of Wisdom’. I looked at my children who were by now wide awake and showed them the rock. I asked them to ‘never’ forget what happened that night! Some friends came over to visit me the coming morning and I showed them the rock, explaining what happened. One of them examined the stone with a loupe . He exclaimed that the stone was indeed special. It was a white crystal quartz with small veins of ‘both silver and gold’ running through it. Now I don’t know how familiar any of you are with gold and silver but ‘rule of thumb’ is that all each can be found in quartz, but both being found in the stone is quite unusual. I decided to get it further analyzed by taking it to a rock shop in the Junction which specialized in gold and precious stones. My friends went along with me, being that I wanted witnesses to whatever I may find out. The owner confirmed what my friends had already told me. For years I questioned people as to where this place could be that I had went to in my dreams, but no one had any idea what the Hall of Learning was or where it could have been. It took me almost 10 years before I was to know the answer. The answer came through my discovery of the works of Edgar Cayce and later, Sylvia Browne. The ‘Great Hall of Learning’ was according to Cayce and Browne, the ‘Great Hall of Wisdom’. Although the name was slightly different the description of where I had been was identical to Cayce’s description. Not only did I now have a name for the place I had went to , but an understanding of how I ‘was able to go’. According to Cayce, I had experienced the phenomena of ‘astral travel’. Now, after all these years, two-thirds of the mystery had been solved. But I still had to question, ‘How did I manage to pull something physical back from the astral into the physical world?’ To me this seemed impossible. The only reference to such a phenomenon was something I saw later on a movie called, Nightmare of Elm Street, where the heroine of the show, pulled Freddy Kruger’s hat out of her dream. Two years ago, a friend finally helped me to solve the final mystery. Although he didn’t know anything about the phenomena, he did have a name for it. He told me it was called ‘Apportation’. Now that I finally had a name, I began surfing the internet for anything I could find on it. Even on the web, I found very little information on apportation, but through perseverance I finally managed to find what I was looking for! The following information is what I have on this phenomena. 1.) Vortices are the result of a tremendous circulatory energy phase out. The phase out is responsible for a certain revolution of a cycle that produces manifestations. When the rings in the vortex have been charged, they allow a clarity of the picture to be manifested. 2.) The entities of pure light are the only ones that can materialize in this and those who have gone through a long period , or phase, of being restructured themselves. Whenever you are going into a vortex of this kind, the person experiences a strong grounding process. Within the energy field is a spiral. If you are not grounded properly, you may come back desensitized and imbalanced. This can be seen as unannounced colored lights appearing in your field from purple to red to also yellow and white. Sometimes what happens is that these lights are so excessive that you will see them come into the house. They would be hovering either around the head area of a person or their solar plexus. 3.) There are certain kinds of grounding stones that are produced from these affects. These stones appear from nowhere and are called apports or materializations. These stones provide the apportioner a protection as well. They come from an instrument of sorts (you) that is created from the spiraling effect of that kind of rapid energy that is given off while you are in apportation. This instrument of sorts contains a very strong solar plexus content of microwaves..which create the stones used for protection as well as healing later. These stones are referred to as ‘Earth Gifts’, which also come from another world plane. The contents of the earth gifts are from the make up of the soil and environment of the other world, which are similar but not the same as the earth plane. 4.) Although not designed for spiritual growth, the manifestation produced by apportation does reveal to us the Manifestation of the Spirit (as Quantum Theory speaks to the creation of matter out of nothing, the Bible substantiates the creation of matter out of nothing as well, most notably at II Kings 4:l-7 — where empty jar after empty jar are filled with oil from one jar — and John 6:l-l3 —where from four loaves of bread and a few fish, thousands upon thousands of people are fed). 5.) The Bible refers to this phenomena as the Manifestation of The Kingdom Within. Everyone has what is called a point of personal manifestation within them, showing them who they are and where they are from. When they reach that strong blending of the Spirit Within and themselves, then this manifestation appears, proving to them that they have just entered the ‘Kingdom Within‘. “Strong wind coming through window, blowing curtains straight out..” I again learned this was not wind at all, but my astral coming back at such a strong momentum it drew the curtains with it, like that of wind blowing through the window. The Superstition Mountains is known for it’s vortices . The vortices in the Sups have even stranger phenomenon than the ones in Sedona, Arizona. The reason for this is that the Superstitions lie on the same parallel (extreme northern edge, 33º 24′) as that of the Devil’s Triangle. “The entities of pure light…..”. During the time of the apportation, I was undergoing hypnosis therapy. The first was past and future life hypnosis. Then I went through the process of shedding myself of all my past inhibitions with the final sessions undergoing extensive spiritual cleansing. So ,at the time of the apportation, you could say my energies were as pure as one could get in this physical life! Many people have stated that meditation opens the gate to astral travel – however, this was not the case for me. Mine was a dream experience of sorts. I did nothing to promote the idea before I went to sleep. As a matter of fact, I didn’t even know such things existed then! What I think happened with me was a combination of events – My cleansing, my desire to find my spiritual source and the vortex. The things that happened during this point in my life changed me forever . After this my spirituality was not based on faith alone, but through a ‘God Experience’. No longer did I ‘believe – I ‘Knew’! Life to me is magic . I take this as a fact. But for those of you that would like to see a little more science behind the apportation phenomena, let me refer to the leading authority, Albert Einstein. In spite of the “rules” observed throughout history in classical physics, in quantum physics, energy ‘can’ and ‘does’ appear and disappear out of nowhere spontaneously” . In Einstein’s equation E=mc2 , E is equal to m c-squared, in which energy is put equal to mass, multiplied by the square of the velocity of light, which then shows us that ‘mass can be converted into energy and energy into mass’. Now that we have that settled, let me tell you of another experience of mine where I brought something from the astral plane into the physical plane. Nothing as dramatic as the 80’s experience, but unique in its own right. mind-originated creation of a human being – in visible form. A thought-form, in other words. To help you understand the process that took place, allow me to explain the principles behind the act of dowsing. For me, the key to dowsing has always been to believe and trust in the magic around us. 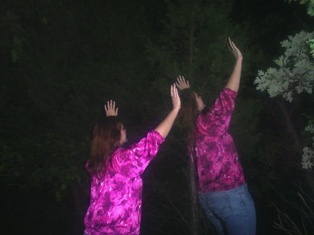 Dowsing is an aide one uses to help obtain the connection to our Higher Self or Holy Spirit. Absolute concentration on this connection is needed for success. In the ancient development systems it was well known that it was the mind itself that was the ‘functional’ device. Our thoughts and thought forms could function as a device to influence and affect other minds and physical material. They also knew that our thoughts forms had to be ‘crystal clear and stable’. This demanded a great deal of practice in “concentration”. It was found that a physical form or device such as the dowsing rods, crystal ball or pendulum could be used as a tool to ‘help’ the mind achieve this concentration and stability. After the person has successfully achieved the ability to concentrate or stabilize his/her thoughts, the assisting tool is no longer needed. The creation of a biological organisms is discussed in the book, The Excalibur Briefing, by physicist Dr. Tom Bearden. Bearden explains that the mind world and the physical world share the same time dimension. Dynamic movements in each world (mind and matter) result in an exceedingly small cross talk being projected into the other world. This cross talk is so small as to be virtual and normally unmeasurable. Establishing one to one cross talk from a mind world constitutes the creation of a ‘biological organism’. Difficult as this may be for some of you to comprehend, there is logic behind this madness – and it falls under the principles that make up our spectrum of reality. Our reality is based on our ‘belief system’. If we belief in something, the brain will filter this sort of information through , sending signals to our senses , which in turn create our reality. We will then see it – touch it – taste it – smell it – and hear it. BUT – that doesn’t necessarily mean it is real. It is only real to the observer. Being that the camera does not have a brain, it cannot be tricked and photographs what is there or not there – thus Brad and I use digital photography in our research to prove out the invisible world around us. It is my hope that our digital photography work in the field of dimensional research will be used as a visual aid for those trying to explain or understand this complex phenomena.